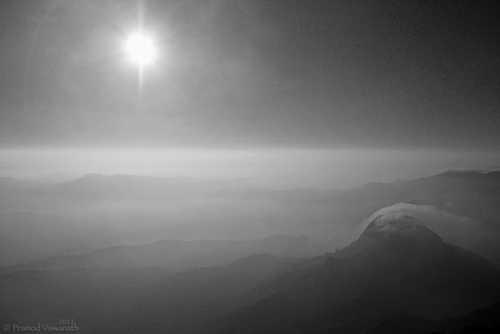 Reminiscing on my past treks and ventures into the western ghats wilderness. It has been more than two years and I still have the vivid memories of my trek to Kumaraparvata. Pristine evergreen forest, music of the endemic birds of the Westernghats, tall trees, sunlight just manage to penetrate through dense canopy. As we navigate through the thick jungle, we are gifted with some idyllic views that fuels our souls. Physical exhaustion vanish. Such is the power of mother nature! After an ardous 6 hour trek to the summit, I just bowed down and offered my prayers to mother earth for making it possible. Extreme windy situations and trekking team dispersed over the summit area, looking for an ideal place to camp. We pitched our tents midst a group of trees to avoid our tents getting blown away by heavy winds. We witnessed a surreal sunset and the rise of planet Venus gleaming like a diamond miles away from earth, as we watched the last light fade away into the oblivion of darkness. I was woken up in the middle of the night several times by the sound of the winds caused by the obstructing mountain peaks. Never in my life I would forget such a dramatic experience midst wilderness. 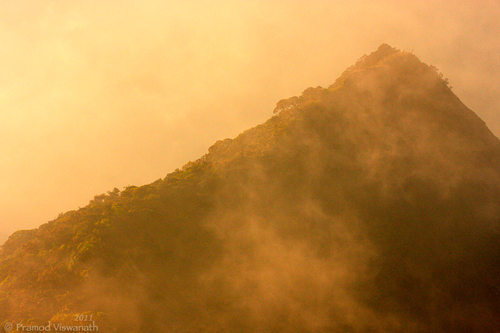 It was dawn and we were gifted with stunning sunrise and the golden rays kissed the mist that rose from the canopies. The atmosphere was electrifying. Best time to visit this place in from December to February when the winter season prevails in the Deccan Plateau. I have shared couple of images here. I have always found it difficult to choose between what images are right candidates for black and white and what images capture the true essence of the scene when presented in color. As I see it, there is a subtle yet significant difference between black and white and monochrome. For me the latter strikes a chord and it is a way to present images in ‘Single color’ ! I have retained the the first image in color because I personally felt that the colors I witnessed during the sunrise and the mood of the scene that played with my emotions is best conveyed when I present it in color. It was a feeling of ‘inner awakening’ for me. Bringing out the monochrome effect in my second image, I tend to convey the ‘cold’ winter morning that I experienced atop this mountain. For me it resonates with the difficulty a mountain poses in front of a trekker, challenges faced overcoming the hurdle and raw unforgiving power of nature! During my time well spent here, I experienced different lighting conditions. From soft warm light of the early morning to harsh afternoon sun to faint afterglow an evening before! I strongly believe that to be a well seasoned nature photographer, one should learn to shoot and bring out the real essence of the scene by shooting in all lighting conditions. Most important aspects of photography when we talk about lighting is white balance. Nature’s inherent nature of ‘morphing’ of color temperature from sunrise to sunset tend to convey and influence subtle differences in our moods as well.